Get educated on biking with your dog. Biking your dog is not an activity to start on a whim without doing your homework (even though some bike leash companies would like you to believe so). The information below will help you understand all the important safety considerations and tips for introducing your buddy to this activity. It's a lot of fun for you and your dog with the proper education. Caution for biking during the summer: Please bike only during the coolest parts of the day and for shorter distances. If you will be on a hard surface, press the back of your hand against the ground and make sure you can hold it for 7 seconds without discomfort to ensure it is cool enough for your dog. Bring plenty of water. Your dog should ALWAYS set the pace. Biking is only recommended for healthy dogs, 30 pounds or more, that are at least 1 year of age. Please purchase the products we carry only after reading safety information below. 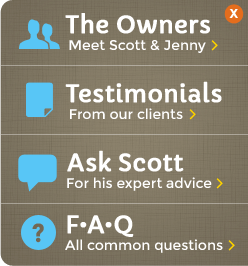 Discussion with your dog's vet or licensed specialist is also recommended. Click for an excellent article on exercising with your pet by Dr. Justine A. Lee, DVM (discusses precautions to prevent heat stroke, pad abrasion and soreness). Please note that Dr. Lee is discussing jogging with your dog (not biking specifically). We are simply linking to her article for her expertise on the subject since the ideal speed for biking your dog is no faster than a jogging pace. Is It The Right Activity For Me? 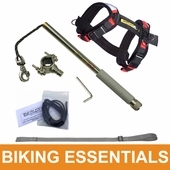 The bike leashes we carry are intended for use by adults that are experienced and comfortable riding a bicycle. The manufacturers of the bike leash we carry caution against using a bike leash when carrying children on the bike. They also recommend that you outweigh your dog by a significant amount (for example, a 100 lb rider wouldn't do well biking a 90 lb dog); this is for the simple reason that the more you outweigh your dog, the more control you will have over the bike. Make sure to abide by local laws and wear a helmet just as you would when not taking your dog along. Remember that biking is just one of many activities you can enjoy with your pup. We still recommend regular walks, games of fetch, trips to the park, etc... - in other words, biking is not meant to completely replace the other activities you enjoy with your best buddy. Lastly, in my experience, the better bond you have with your dog, the more fun and enjoyable this activity will be for the both of you. Is It The Right Activity For My Dog? Biking can be an enjoyable activity for both dog and owner when the right precautions are taken. We recommend biking with a bike leash for dogs that are at least 30 lbs. For dogs 25 lbs and under, consider one of our dog bicycle seats or trailers. In most cases biking with a bike leash is an activity that is best suited for medium to large dogs. Your dog needs to be in good health and it is ideal to get a checkup with your dog's vet before beginning any serious exercise. Dogs with slight builds will be able to bike for longer distances than heavier or more muscular breeds so keep this in mind when deciding how far to bike your pup. Breeds such as Bulldogs and Pugs that have flat faces are not designed for distance running because they can become overheated very quickly. They also don't move air in and out as efficiently as other breeds. Breeds with long bodies or short legs also aren't designed for distance running and this should be taken into consideration. Biking is not an activity for puppies. Your dog should be at least a year old and a minimum of 30 lbs to start biking. They should be closer to a year and a half before biking longer distances. Please use common sense when biking your dog. Build up stamina slowly and never push your dog beyond their means. Ideal speed is no faster than a jogging pace. Please use your best judgement when biking your dog and always err on the side of caution. As we all know, dogs will do anything to please their owners and I would hate for someone to accidentally push their dog too hard with one of the products we carry. Your dog should always set the pace and distances should be limited until you have conditioned your dog properly (please see more on this further down on the page). I say this respectfully, but if you have a dog that is very small and/or you plan to disregard the safety tips we offer, please don't purchase a product from us. Safety for our four legged friends is our number one concern at The Dog Outdoors. I want your dog to enjoy this activity and do so in a safe and comfortable manner. It would break my heart if anyone used the products we carry in an irresponsible manner and put their dog's safety in jeopardy. The fact that you are reading this page tells me you also put your dog's well-being first and foremost. Thank you for being a responsible dog owner! In addition to you and your dog's safety, it is important to get your dog acclimated to biking in an area with as few distractions as possible at first. Only once your dog is comfortable biking and you feel in full control should you begin biking in areas where others share the road, path or trail. One of the most important things to remember is to not extend the cord so far that you and your dog are taking up too much room on the trail. This is one reason a bicycle leash is safer than biking your dog with a long normal leash. Your dog needs to be under your control at all times when around others for your safety and theirs. A trotting pace is best when others share the road. Remember, we offer a full refund on the biking equipment we carry if you aren't completely satisfied or your dog just isn't into it. 3) Respect others on the road & trail. Ideally it is best to use a cruiser or mountain style bike - something with standard or wider tires. I don't feel that bikes with skinny racing style tires would work as well. In some cases recumbent style bikes or trikes can work out great as well with the Bike Tow Leash (shoot us an email to see if your model might work). If using the WalkyDog, a non-restrictive comfortable dog harness is highly recommended - preferably with padding. Using a dog harness with the Bike Tow Leash is a personal preference. If using a harness with the Bike Tow Leash, it is important to make sure that it doesn't allow your dog to get too far forward on the bike. This will make it harder for your dog to determine when you are turning towards him/her. Paw pad protection. It is important to monitor the wear on your dogs paw pads. They will toughen up over time, but products such as Musher's Secret can help condition, protect, and make your dog's pads more resilient to all types of terrain. Plan your biking route ahead of time and slowly build up the distance you take your dog. Short rides at the beginning - no matter if your dog wants to keep going or not. Cooling vests for summertime heat. I strap a large thermos with cool water to my bike and take Parker's cooling vest along for the ride with us. Some dogs take to this type of exercise right away and others need to be acclimated a little more slowly. Of course there are also dogs that just aren't cut out for biking. This is why we offer a 100% Satisfaction Guarantee on our bike leashes in case you or your dog are not completely happy. The safety and enjoyment for both you and your dog are our #1 concern. The best way to introduce biking to your dog is to start by bringing them around the bike first with a normal leash. Use of treats is recommended and/or positive praise. Get them used to just being next to a bike and the sounds it makes before attempting to attach them to a specialty bike leash. Once they are comfortable, you can move on to attaching your dog to the bicycle leash and walking alongside your bike on the opposite side of your dog. The idea is to let them get comfortable with the bike being next to them and realize it is no different than taking a normal walk. 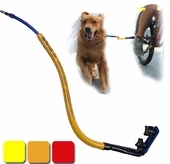 If using the WalkyDog, make sure that you have adjusted the cord length to make your dog feel comfortable. To do this you can remove 1 or 2 internal springs, add a leash extension, or create a custom length line (watch video on this page). Once they have going straight down, practice turning left and right and then u-turn to either side. Once your dog seems confident, hop on your bike and ride slowly at first practicing the same maneuvers. It is best to begin in an area with few distractions so that your dog will focus on you. I suggest biking at a trotting pace. Your dog should never be falling behind so make sure you are riding at your dog's pace. If your dog gets nervous and freezes up, DO NOT attempt to keep pulling them along; immediately stop and start walking next to the bike again. We do not recommend biking in areas with heavy traffic. You cannot just start biking miles on your first time out. You need to gradually increase your dog's stamina. According to canine expert Christine Zink, D.V.M., Ph.D, you should gradually increase the distance you travel by 5 to 10 percent every four to six exercise sessions. She recommends that once you reach a distance of 2 miles, you should limit biking to every other day providing a day of rest for rejuvenation of the muscles. Extremely fit dogs can run farther distances per day if the sessions are broken up (less if riding on pavement, which can be tough on the skeletal system). Personally I even feel like a couple of miles is plenty. At the end of your ride, pay attention to how your dog reacts. Are they panting heavily for over 10 minutes and laying down (you probably went too far) or do they seem to be ready for more. In the hot summer months remember that your dog can become overheated quickly. Only ride during cooler parts of the day and make sure the pavement is not too hot. Also make sure the rides are for shorter distances. Your dog can become overheated quickly since they cannot cool their bodies through sweating like humans. Parker and I usually ride a mile or two every other day. Sometimes we break up the rides. Obviously, be sure to stop to rest occasionally and always monitor your dog for signs that nature is calling. Also monitor your dog's pads for cuts or scrapes. Consider using a good paw pad wax or even protective booties if riding on rough terrain often. As I mentioned before, please use common sense when biking your dog. Remember that he or she wants to please you and can't communicate that they are getting tired. Always err on the side of shorter distances and slower pace when in question. During the summertime when temperatures spike, it is VERY important to only bike your dog during cooler parts of the day and for shorter distances. If biking on pavement be sure to check the temperature of the pavement before biking and that your dog's pads have become accustomed slowly to pavement riding. If you can't hold you hand against the road for at least 7 seconds without discomfort, don't walk or jog with your dog. Always bring water along for the ride and take frequent breaks. Consider bringing along a dog bike trailer with a cool wet towel or cooling pad inside to give your dog a rest on the way home. You may even consider looking into a dog cooling vest. Keep an eye out for signs of heat exhaustion such as if your dog's tongue becomes very wide and curls up at the end. Please take care not to push your dog in the summer (even if they want to keep going)! If they become overheated, the best way to cool them down is from the bottom up. You can spray them down with cool water on their paws, legs, underside and head/neck first - then get them into a cool environment as soon as possible. If they don't improve, don't hesitate to take them to a vet immediately. For further learning, here is an external article by Dogtime discussing the damage extended jogs on pavement or walks/jogs on hot pavement can cause. Please be mindful of the terrain you bike your dog on. While dogs' paw pads are tougher than human feet, they too can be sensitive to rough terrain. This is especially true when beginning a biking regimen. Ideally, biking on grass or dirt trails is best, but this is not always possible. If biking on pavement is necessary, please make sure to build up your dog's tolerance slowly over time and give the pads time to toughen up. Using a paw pad conditioning wax like Musher's Secret can help. If possible, mix up the terrain you bike on so that your dog is not constantly running on pavement. Please do not let your dog run on chipped asphalt (this can really do damage to the paw pads). And remember, if you can't hold you hand against the road for at least 7 seconds without discomfort, don't walk or jog with your dog. While boots can be an option in some cases, we have yet to find a brand of boots that will hold up to constant running on pavement over time. As noted previously, we recommend biking for dogs at least 30 lbs and a year of age or more. If your dog is below 25 lbs we strongly recommend against biking for their own safety. Even if your dog is a high energy breed, please consider another activity. The last thing we want is a dog being pushed beyond their limits or hurt while using a product we carry. The bike leashes we carry are just not designed for dogs this small. If your dog is above the minimum, but still on the small side, it is important to bike at a slower pace for shorter distances. We also strongly advise a padded secure harness such as the Ruffwear Web Master harness. 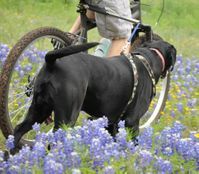 We have answers to all your questions about biking with your dog and if it is the right activity for you and your pup/s. Browse through our dog bike leash buyer's guide and if you can't find an answer to your question there or in our Frequently Asked Questions section, just shoot us an email and we will promptly get you the detailed answer you are looking for. Email us 24/7. Want to know everything there is to know about biking with a dog? Go Back and Get Your Bike Leash Now. Click Below on the images.